On this date, April 12, 1961, the Russians launched the first man, Yuri Gagarin, into orbit in space; a truly great feat in human history. 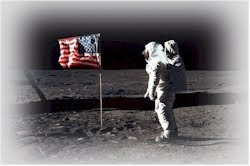 This helped inspire Americans to go to the Moon, harnessing American ingenuity and can-do spirit! That first step on the surface of another world was perhaps the greatest feat in human history. It must not be our last great feat. Russia has announced new plans to build a permanent base on the Moon, mine helium3, and go to Mars--an ambitious program to take the lead in space exploration and technological development. Today also marks the 30th anniversary of the first space shuttle launch, also a feat worthy of great honor. NASA sadly used the occassion to announce how to dole out the relics of our once-great space program: where the shuttles would be displayed. The administration had earlier cancelled the Ares V rocket which could take Americans to the Moon and Mars, and cancelled even the plans to go to the Moon at all, rendering a US human Mars mission essentially impossible. It is not too late. Perhaps our leaders can awaken to the dangers of abandoning American leadership in space--losing the jobs, skills, technology, and investments to other countries. A good date to reverse course would be May 5th, the 50th anniversary of America's first man in space; Alan Shepard. A better date might be to use the 50th anniversary of JFK's famous speech that put us on a specific course for the Moon "in this decade." Mr. President, launch America back to leadership in space and you will launch America back to prosperity. Indeed we could build a manned base on the Moon "in this decade" which would be used to develop and test the technology to use for a Mars mission. We could also complete a manned mission to an asteroid "in this decade." The technological hurtles are far less than those which faced American engineers in 1961 in building Apollo. The rewards in tech investments, jobs and new inventions will help secure a prosperous future for all Americans. And here's a desperate plea to save the shuttles. Discovery has already been destroyed as a flightworthy spacecraft (many systems were removed for museum display), but you can still accept United Space Alliance's proposal to privately operate Endeavour and Atlantis. You must do it now, for soon after Endeavour's last mission, she too will be gutted and made impossible to ever fly again.